Having trouble keeping local wildlife from pillaging your vegetable garden? 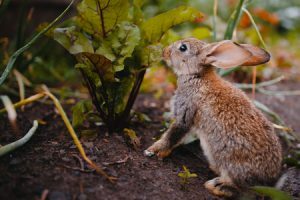 There are a number of effective strategies you can use to prevent these varmints from gobbling up your garden without harming the animals. Check out a few humane solutions to your varmint problem below! Protect your garden with a fence. Your first line of defense whenever you plant a vegetable garden should always be a fence. You can use wire mesh and wooden posts to build a simple, strong fence around the perimeter of your garden. Make sure the it’s at least 2-3 feet tall and bury the excess wire about a foot underground to prevent burrowing animals from digging under the fence. Place repellents around the garden. There are several harmless repellents you can use to ward off varmints as well. Many gardeners scatter human or pet hair around their gardens to frighten animals away. Hot pepper flakes and granulated urine from predators like foxes can also help keep varmints at bay. Blood meal is another popular repellent that can deter varmints while replenishing your plants with nitrogen. Install a motion sensor light. If varmints are infiltrating your garden at night, a simple motion sensor light might do the trick and stop them from coming back. Just make sure it’s not pointed in a direction that might disrupt the sleep of you or your neighbors. Need to find the right tools for your next gardening project? You can rent them for a fraction of the purchase price from Lawrence Tool Rental! Give us a call or contact us online today to get started!